With less than forty days to go before Marvel’s Daredevil returns to Netflix, it’s high time to start looking forward to the second season – and revisit the first. Before getting to the latter, I wanted to take a moment to talk to you about some of my own expectations, hopes (and fears!) going into this next chapter. As always, I’m looking forward to hearing from you guys in the comments. Agree or disagree? Let the rest of us know! Daredevil’s first season got rave reviews; there’s not doubt about that. It impressed the critics, won the title character new fans, and even managed to satisfy most of the old ones. This is no small feat. My own opinion of the Netflix series changed dramatically between my first and second viewing. I’ll admit it: After sitting through almost twelve solid hours of television on the day of the premiere, I was emotionally exhausted and nursing a massive headache. I didn’t realize until then just how much I had been holding my breath for this, and just how worried I had been that the show wasn’t going to be to my liking. I’m obviously very emotionally attached to this character. And, during the first viewing, I was bound to be excessively vigilant when it came to spotting any flaws which pretty much set me up for disappointment. Me being me, I let things like the poorly conceived “world on fire” effect, or the inexplicable scene of Matt sensing the contents of a box across the room in episode six, overshadow all the good stuff. The second time I watched the series, which was later that first weekend, I was able to relegate these minor nuisances to their proper place. All things considered, this really is an impressive show. 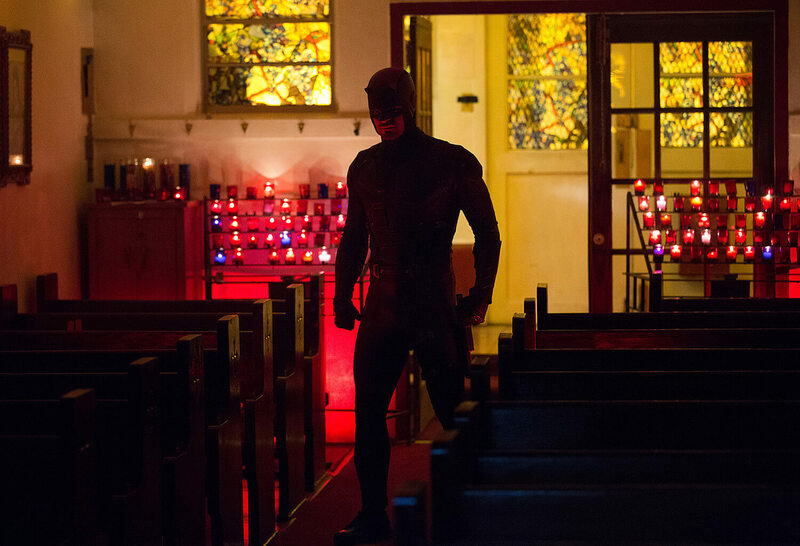 Having watched the show more than half a dozen times now, I’ve even come to consider its portrayal of Matt Murdock one of the very best interpretations of the character. However, this doesn’t mean that there isn’t room for improvement, which brings us to this post. While one might argue that it’s more difficult to repeat the success of a first season than make just that one successful season, there are many examples of television shows that have taken longer to hit their stride or even continued to outdo themselves over several seasons. In the case of Daredevil, I think there are a couple of key things that should lead us to expect more. I love a good origin story, and I think most of us agree that Daredevil needed that story to be told. In the case of superheroes, the origin tends to matter a great deal and almost takes on mythical proportions. The origin is a big part of what makes the hero; what inspires him (or her) to do what they do. In the case of Daredevil, the origin story is a massive trauma delivered in two stages. First there is the accident which cost him his sight, and gave him heightened senses, and next we have the death of his father. In the Daredevil show, these two events take place in short succession, unlike in the original story from the comics, but that’s not important. The important thing is that these two events are central to who Matt Murdock is. I think that season one got it right by putting these events right at the very beginning with Matt’s accident happening in the very first scene, while the second shows him talking about his father in confession. And, I loved the portrayal of Jack Murdock. Loved it. Still, it’s a very good thing to have this crucial development out of the way for season two. That’s not to say that I wouldn’t love another flashback to Matt’s childhood (if only to get another chance to see John Patrick Hayden in action as Jack) – and we know for a fact that there will be flashbacks to Matt’s college days, so that we can be properly introduced to Elektra – but the fact that we already know what Matt Murdock is about going into season two is a very good thing. Not only that, we will actually have Nelson & Murdock already up and running, Foggy finally being wise to Matt’s secret life and heightened senses, and Matt’s journey to fully becoming Daredevil completed. These developments all made for good stories during season one, but having all these pieces in place bodes well for season two. One of the, albeit minor, issues I had with season one was the pacing. While good overall, there were slow patches here and there. We’ve already learned from the new showrunners that the coming season will be moving along a bit faster, and I think that’s a great thing. I’m hopeful that the almost twelve hours of entertainment ahead of us will also have plenty of room for some legal action and great character moments. As mentioned in a previous post, I’ve never been a huge Punisher fan. That does not, however, mean that I’m not over the moon excited to see Jon Bernthal tackle this character in the coming season. While there’s also Elektra (more on her below) and the reappearance of Stick (in three episodes this time) to make sure that the more mysterious realm will also be touched on, the inclusion of Frank Castle is a sure sign that this show stays grounded and close to the streets where Daredevil belongs. Having the Punisher on the scene will also help the main character, and his audience, get a better sense of who he is. Or, in this case, get a better sense of who he is not. I fully expect this to bring out new aspects of the character. Speaking of which, we’re bound to see some developments in Matt’s love life. Not only is Elektra showing up and shaking things up – though, of course, she is so much more than just Matt’s old flame – we’ve also seen the people behind the show tease a romantic relationship between Matt and Karen. I know that this probably leaves a lot of people cold, but I actually look forward to seeing this side of Matt, regardless of who happens to be on the receiving end of his attention. Why? Because it humanizes him. Let’s have more parkour! We only had ONE SCENE of it in the last season!!! WTF??? Please, please, please, somebody buy Matt a razor. It’s okay for him to have five o’clock shadow at the end of the day, but no lawyer would show up to work looking so shabby, EVERY DAMN DAY!!! I’d love to see the DD and Punisher emblems too. They are most definitely part of the iconography. Agreed on most everything, though I have two worries going into Season 2. A minor worry that Daredevil might get overshadowed in his own show by Punisher. A major worry, judging by the images so far, that they did not address the weaknesses in the way the red suit fit Matt. I have no problem with the way it looks, but it just didn’t fit him right in the face and limited his movement way too much. I still stand by my assertion that the fight with Fisk in the final episode is probably the weakest moment of the season for that single reason. You could tell he was struggling to move in some moments and others his fighting style was greatly reduced. I agree completely about Karen. While I think the romantic aspect is an absolute must, I’d also argue it’s just the interaction with his friends and his law firm that needs more attention. The first season did a lot with Foggy and Karen together. Now I’d like all three or the two with Matt. Great blog yet again- I am pumped for this new season! My reservations are the growing cast and yes, as mentioned, how the Punisher may overshadow DD!… Also I do hope there is more courtroom drama – it’s part and parcel of Matt/DD, and it gives further credence to the series being grounded. I have this nagging feeling season 2 will intro us to Maggie or Sister Maggie. Calling it now. As for Karen and Matt, just not feeling the fire there. Matt just has this massive chemistry with Claire. I liked that season 1 gave us two mature individuals walking away from a relationship (despite immense chemistry and attraction) and decide for what’s right for them (though it was mostly Claire doing the walking away)… its was a novel approach on an on-screen relationship but at the same time it tore me apart because Matt seems to be himself when he’s with Claire. There’s just so much connection there and honesty that I’d hate for it to be put to the side on season 2. Also, really hoping they adapt The Devil in Cell Block D as the last part of season 2 to bring back Fisk. Bring on Rosario Dawson as Claire. I agree there’s way more flirty chemistry between her and Matt than Karen and Matt. Bring on Frank Castle. Super excited for this. Just saw the season two trailer. Looks awesome! All the things that made season one so good seem to be coming back. Lots of Punisher. I love all the contrast between Frank and Matt. Good psychological stuff going on underneath all the action, which is great. I find it interesting that Frank used the same half measures line that Stick used. I still think it will be a waste if those two don’t get some screen time together. All in all I’m really looking forward to season two and delving deeper into Daredevils world. I also find the new angle that Matt might have helped inspire Franks vigilante lifestyle very interesting. And something I thought of, Christine what are your thoughts on the controversy about Wally Wood not being mentioned in the credits for season one? your last statement was glowing in the dark after the TV went blank daniel.. the so many changes of direction, major and more subtle, once wood came aboard were far and too many to have been coincident in anyway.. no matter what the letters says.. there is no denying that his talent as an artist was sought out, with him being invited..
from wood’s initial issue’s twin D and portrayal of mwf holding his ears in pain (which would evolve to a level we all know).. to of course the red duds issue where but there he also fights one of the oldest anti-heros as that which he himself would in turn come be torn between in future.. the give away upper left hand corner’s small framed figurine with the halos around his head.. and next issue’s full scale but barely visible thin rings on the whole cover.. #6’s moving picturesque multi-action (triple) strike set up in a single swing on the one handed cane..
another genius gone much too soon.. and unsung?.. have i rambled so much?.. forgive me people..